Tonight I created a light, Italian inspired dish perfect for a spring evening. It begins with a bed of fresh spinach topped with pasta, veggies, and two proteins. 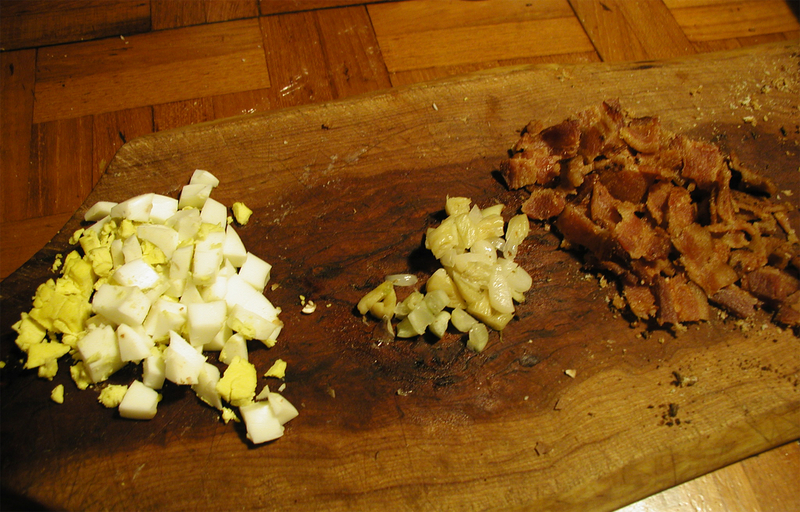 Much of the preparation lies in the dish's assembly, as the mushrooms, egg, and bacon need to be chopped and the garlic and pasta must be cooked (bacon should be pre-cooked.) Once ingredients are ready, all that remains is put together your salad. To create the dish, you’ll be working on several things simultaneously. First, boil a large pot of water in which to cook the spaghetti, and preheat your oven to 400 degrees. As the water boils, peel garlic cloves and place them on a small sheet of aluminum foil. Wrap the foil around the cloves to create a package. Before closing the package, lightly drizzle garlic cloves with olive oil and salt. Add pasta to boiling water and sealed package of garlic to hot oven. Slice the mushrooms in half lengthwise and then chop into pieces down the width. Crumble cooked bacon into bits, and dice hardboiled egg. When pasta and garlic cloves are tender (after about 15 minutes), remove garlic from the oven and drain pasta. Chop garlic cloves into bits. To assemble the salad, make a bed of spinach leaves and cover with pasta. Then top with mushrooms, egg, bacon, and garlic. To finish, drizzle with truffle oil, olive oil, and fresh ground black pepper. The dish is best served cold, accompanied by a chilled glass of white wine. I recommend a pinot grigio.